A couple of months ago, I had a vacation in Ilocos along with some good friends. One of our friends, Tantan, offered his house so that we could have a place to stay for a couple of nights or so since we did not want to spend too much on a hotel accommodation and the house was just a few minutes away from the popular tourist spots that we were planning to visit. The house is very typical of modern provincial houses – unplastered brick walls, iron galvanized roof with no ceilings and a huge window overseeing the native chickens and ducks roaming around a spacious lot where all sorts of native vegetable and bushes are planted. Tantan’s family was very warm and too generous to lend us two of their bedrooms. Sure, the place would not equate to some sophisticated suites that Manila had already overindulged us with but there could be nothing more comforting than the sweet atmosphere and tranquility that only the countryside has the ability to offer. You could experience that life is just as simple as fetching water from the man-made well, taking a bath in a makeshift bathroom, chopping dry woods for cooking and getting your food straight from the nature. And here is a simple and shameless way to enjoy nori! The surrounding was so cool and refreshing because the seashore is just a few meters away from the house. We spent our first night drinking red wine by the sea! On our first morning, Tantan’s father prepared some special seafood breakfast banquet for us. We were spoiled with some fresh catches straight from the sea and these were not the usual seafoods that we normally get the chance to eat here in Manila. A basin full of fresh sea urchins was prepared specially for us. Eating sea urchins for the first time was definitely an acquired taste for me. It literally tasted like the sea and the fishiness and after taste was honestly quite unbearable at first but I eventually get used to it especially when I learned to dip the fresh pinkish flesh (freshly scraped off from the shell) in highly spiced sukang Iloco (Ilocos vinegar). It became reminiscent of the kinilaw na hipon (shrimp cooked in vinegar or citrus acid). The taste of sea urchins was an acquired taste for me. The father also prepared a favorite Ilocano seaweed salad, pokpoklo. Pokpoklo or pukpuklo is a traditional Ilocano appetizer usually served with sliced tomatoes. The appearance looks like green earthworm with a slippery and rubbery texture. It was like eating a grainy, slimy and salty gummy worms. It was not my first time to try this kind of salad as I clearly remembered my Ilocano grandma used to serve this to us when I was a child. It is best paired with grilled or fried dishes. Pokpoklo, a traditional seaweeds salad by the Ilocanos. One of my favorite among the dishes is the exotic adobong pugita (octopus adobo). Tantan’s father went to the sea that morning to catch us some fresh octopus which he usually dries under the sun before slicing into bits and cooking into tasty adobo. I will talk more about the dish and the recipe in a separate blog post. One of the best seafood adobo dishes that I have tried, adobong pugita. Lastly, one of the perks of living just beside the sea is being able to enjoy an abundant supply of nori fresh from where they came from. You could definitely eat nori seaweeds like you were eating rice. The nori sheets that I saw are rather thick and unprocessed. You could easily spot the difference from the ones commercially sold in the city which are more lightweight and paper-thin. And what is the best way to make it with, with this enormous amount? 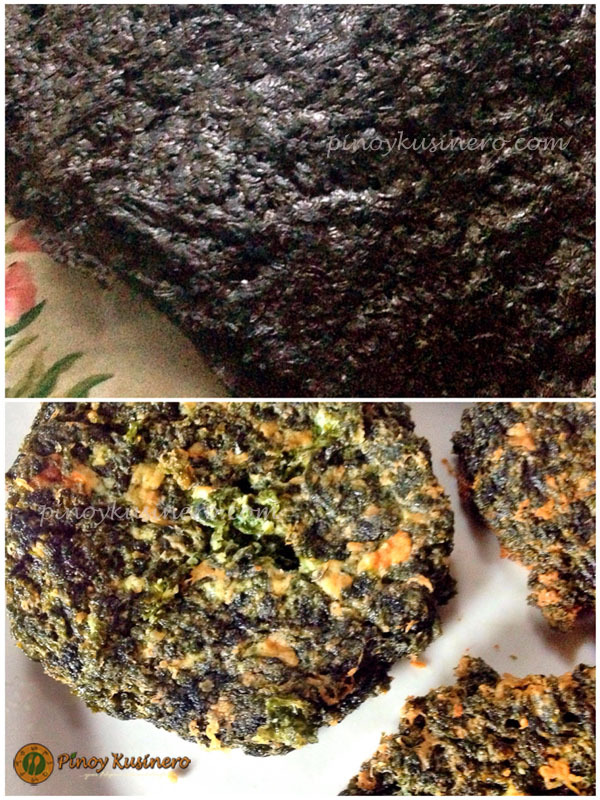 Turn them into delectable Nori Omelette Pancake. This is certainly one of the numerous privileges of having a friend whose home is just nearby the sea – you can enjoy nori omelette anytime you want. I want to show you a simple and shameless way to enjoy it! Aside from omelette and sushi wrappers, can you think of other recipes that we could make out of abundant and fresh supplies of nori? Kindly comment your suggestions below. One of the perks of living just beside the sea is being able to enjoy an abundant supply of nori. In large bowl, beat the eggs using a fork or whisker. Add garlic powder, black pepper, chili powder (optional) and salt. Continue to beat to incorporate the seasonings. Add the nori and mix well to combine all the ingredients. Heat the cooking oil in a frying pan. Gradually pour the egg mixture and cook over low to medium heat until the omelette is set. Flip the egg to cook the other side. Transfer on a serving platter and serve with steamed rice and your choice of dipping sauce. Serve with sliced tomatoes or spicy Ilocos vinegar on the side.